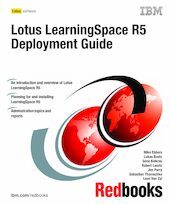 This IBM Redbooks publication describes Lotus LearningSpace R5 in detail. LearningSpace is a framework for managing and delivering online courses. It provides a Web interface and a back-end database for organizing, delivering, and tracking such courses. LearningSpace 5 provides tighter integration of its product components than previous versions. In addition, it offers many new features and tools to both the instructor and student. These include record and playback, improved audio/video, and breakout sessions, as well as enhanced administrative features. The popular topic of reporting is covered in detail. The book first introduces Lotus LearningSpace R5, and then discusses planning considerations. It goes on to explain the installation process, and concludes with a description of the administrative tasks, including reporting. This book will be useful to anyone who needs to plan for and deliver a Lotus LearningSpace R5 e-Learning system.